Day 1 was the 6.2 mile swim and 90 mile bike ride to the Volcano. 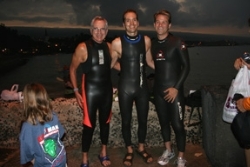 We assembled at the starting line in downtown Kona at 6:00am. Before the swim, all the athletes prepared themselves for the long day by joining hands and saying a prayer for safety and success. 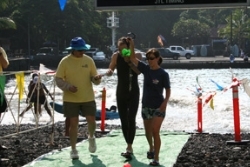 The swim is challenging because, depending on the ocean conditions, the waves can make some people seasick. Imagine getting on your bike and trying to ride 90 miles feeling sick to your stomach. Not cool. 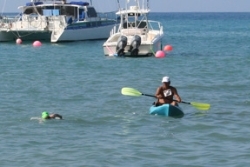 Philip, accompanied by Lorin his kayak paddler, followed the coast line south to Kalhula Bay. The water was a bit rough with 4 to 6 foot swells. 3 1/2 hours later Laura and I helped Philip out of the water and on to dry land. He was feeling a bit queasy but made his way to the shower to wash off some of the salt; dry off; hydrate and get ready to ride. Once we got him clean, dry and hydrated we doused him with sunscreen and off he went on the 90 mile bike ride to the Volcano. The swim is the easiest phase for the support team. Once out of the water, the regular schedule of hydration and nutrition begins. If Philip doesn't get enough water and calories, his muscles will not be able function effectively today or recover for the 172 bike ride tomorrow. The 90 mile bike ride to the Volcano heads south through the Kona coffee plantations, past the southern lava flows and finishes in Volcano National Park. The first several miles are a 1000ft climb from the water. Not the best for the legs right after 6.2 miles of swimming. We started the hydration (water) and feeding process at the top of the climb. For the next 90 miles, Philip would consume a variety of performance gels, Fig Newtons, bananas, cheese crackers and turkey sandwiches. The goal was to make sure he ate at least 400 calories an hour. Water was very important because of the heat so he received a steady stream of water bottles filled with 50% Gatorade and 50% water. Nancy and I would trail Philip in the car in case of a flat tire and then rush ahead to meet him at the next refueling station. Laura and the kids were not far behind taking pictures and cheering daddy on to the finish line. After traversing the southern coast and ascending to the Volcano some 4000 feet above sea level, Philip finished Day 1 in 10 hours and 23 minutes. Immediately after getting off the bike, I did some passive leg stretching with him; we carbo loaded with cold spaghetti and then it was straight to the massage table for some badly needed work on his legs. It was off to dinner and good nights sleep in preparation for Day2.